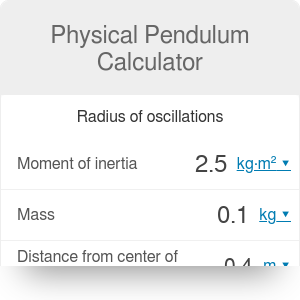 With the Physical Pendulum Calculator, you can compute the frequency and period of a physical pendulum. The text describes what exactly the physical pendulum is and how a moment of inertia affects its oscillations. You will also learn the equation describing the period of a physical pendulum and what radius of its swings is. A physical pendulum is any object performing small oscillations around its equilibrium position. An example of a physical pendulum is a swing known from kids playgrounds or a swinging weight of a pendulum clock. Oscillations are small when the maximal angle doesn't exceed 15º. If it does, the physics of the pendulum is more complicated. During this movement kinetic energy is transforming into potential energy, and vice versa, but the sum of these energies is conserved. T = 2π * √(I / (g * m * R)). R [m] is the distance from the center of mass to the pivot point. that appears in the equation for the period of a physical pendulum, is called radius of oscillations. It has a dimension of length. Two different pendulums with the same radius of oscillations have the same period. The period of oscillations depends on the mass of the object and its moment of inertia. Moment of inertia tells us how mass is distributed in the object. Objects of the same shape and weight may have different moments of inertia. For example, if in one of them the mass is spread uniformly and in the other, it is concentrated only in some areas. Moment of inertia depends on the reference point. The one appearing in the equation for the period of oscillations is computed with respect to the pivot. With our calculator computations of the period of oscillations of a physical pendulum is simple. Just specify the moment of inertia of the object, its mass, and the distance from its center of mass to the pivot point. You can also play with the acceleration of the gravity to see how the period would change if we were on a different planet. The calculator also computes the reciprocal of the period, that is the frequency of oscillations. Let us describe a pendulum made of a small ball of mass m hanging at the end of a rope of length l. The pivot point is at the other end of the rope. We assume that the cord is very light, so most of the mass is concentrated in the ball. The center of mass is then in the ball. T = 2π * √(l / g). Physical Pendulum Calculator can be embedded on your website to enrich the content you wrote and make it easier for your visitors to understand your message.